It was relatively early in Barney’s congressional career, a period during which he generally didn’t rely heavily on staff. Because he was so smart and such a skilled legislator, the role of staff was simply to supply him basic information, not advise him on strategy or tactics. Thus, he didn’t think it would matter much that he was going to the House Floor with an amendment staffed by a guy who only a few years before was stocking shelves in a supermarket. Boy, was he wrong. My job was to work with an environmental lobbyist to get the amendment drafted and write the “Dear Colleague” letter to other Members of the House encouraging them to vote for it. The amendment had been offered in the past and covered pollution of ground and water, in keeping with the priorities of the Superfund law. The environmental lobbyist said to me, “Why don’t we add ‘air’? Dingell won’t like it, but it’s not going to pass anyway, so why not?” Fatefully, I said, “Sure!” Her mention of John Dingell referred to the fact that he was notoriously opposed to any restrictions on air pollution due to his intense support of the automobile industry that employed many of his constituents in Detroit. So, we added “air” to the kinds of pollution that would engender increased liability for the polluters. Polluters like the automobile industry. I drafted a memo to Barney that included a reference to the change and dropped it in his inbox. But I didn’t do anything more to flag the change that had been made to the amendment. He didn’t read the memo. On the big day, I was vibrating with excitement as I accompanied Barney on to the House floor and took my seat next to him in one of those roomy leather chairs that you can see on CSPAN. Barney stood up to introduce the amendment and gave his opening remarks in its support. After a few minutes, in the middle of Barney’s speech, the fearsome Chairman of the Energy and Commerce Committee, Rep. John Dingell (aka The Truck, Big John and other less flattering names), stood and said, “Will the gentleman yield?” Barney, of course, yielded to this much more senior Member of the House. Recognizing that Dingell had information that he did not have, Barney danced a bit. “It is substantially same,” he said. He went on to give himself some wiggle room on the text of the amendment but continued his opening statement. Barney knew he was in a bad spot and said, ”I’m sorry, I have limited time. The gentleman from Michigan can use his own time when I’m done,” and continued his opening statement to its conclusion. Dingell tried to interject a couple more times, but Barney simply finished his statement and sat down next to me. It was the only time I ever saw Barney bested in floor debate and it was my fault. My best day as a legislative assistant had turned into my worst. 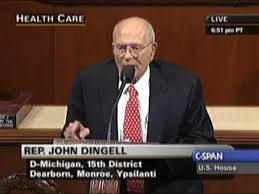 I forget what Dingell said when he got his time. I assume he railed against being blindsided by this change in the amendment and pointed out that air was generally outside the scope of the Superfund law. Both points were, of course, true. Barney eventually made amends with John Dingell, but no doubt the price was high. I suspect somewhere among the thousands of votes Barney cast, most of them reliably in support of liberal causes, you’ll find one or two against regulation of air pollution or in support of gun rights. Dingell’s two passions. As for me, I never set foot on the House floor again while working for Barney.